A recent review from our friend Brent Gaskill at OnshoreOffshore Magazine does a great job at explaining our unique stepped hull design. The following is an excerpt from the fantastic article from Brent who also runs a successful guide service outfitted with an Avenger Pro Series. "The Avenger Pro Series is different from all other bay boats because of its unique step-hull. The 1-1/2 inch step ventilates the hull allowing it to run on a cushion of air bubbles. This provides a super soft ride while also creating lift in the transom, which allows the boat to run extremely shallow on its padded keel. 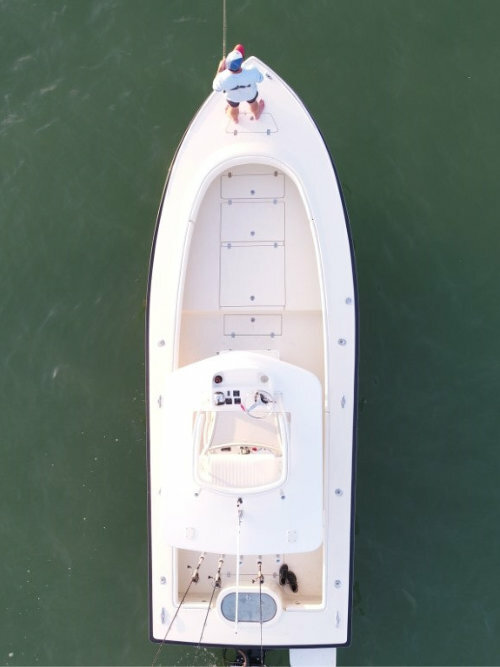 The sharp entry dead rise provides a big boat feel in open water on a boat that also performs in shallow depths suited for much smaller skiffs. This hull design is a one of a kind. The concept was developed from seaplane pontoons that included a step to give a point of release from the water's friction. This release gave the plane additional speed in a shorter distance for take-offs. When water flows over a curved surface, friction is multiplied thus slowing the craft. When release points are created, as with a step, the water breaks free of the surface allowing the craft to speed up creating efficiency. This older hydrodynamic theory has carried over into new technology for the Avenger 24 creating a very dynamic and fuel efficient planing surface. The original 24 began with an idea jotted down on a napkin that eventually was turned into a wooden plug, from which a mold was laid up. This boat is not a remake of an older style hull with a new, dressed up inner liner. The Avenger 24 has been on the cutting edge from its inception. The ideas were so new that no one knew what to expect until the first boat was floated and tested. As it turns out, the ideas on the napkin were off the chart and an exceptional performing boat was created. Minor adjustments and improvements have recently been made to the original design. Two new lift strakes have been added, allowing the bow to ride higher. A baitwell was added in the transom to help distribute weight, improving the boat's handling by providing a balanced ride."